I was asked recently on the 52 Portraits in 52 Weeks Facebook group by a new member as to how I am keeping track of my progress. Aside from posting to an album in the group where at least the number is close, I use a planner. The number in the album is close only because I posted on picture to show my starting point before I started on this project. I needed to keep myself on track (or at least know how far ahead I am). 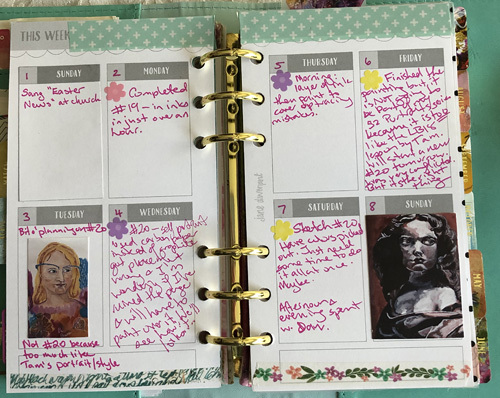 I bought one of Jane Davenport's planners, the Learning to Fly one, and in the month section I wrote in each week the number of portraits I should be at. Bonus: I get to be a bit of a planner girl and put in stickers and decorate with washi tape. One of the reasons I have taken on this year-long project is to do a little bit of art every day. And so I'm journaling briefly as a last act before turning out the light and going to sleep. 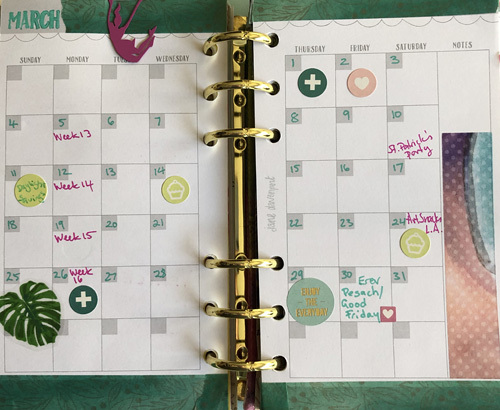 And every now and then I will have enough of the portraits resized about 1.5" wide to print out onto a photo, cup up and stick into the planner. And yes, my handwriting is messy because it is way more important to note that I have created, what I have created, and how I feel about it than to make it pretty. 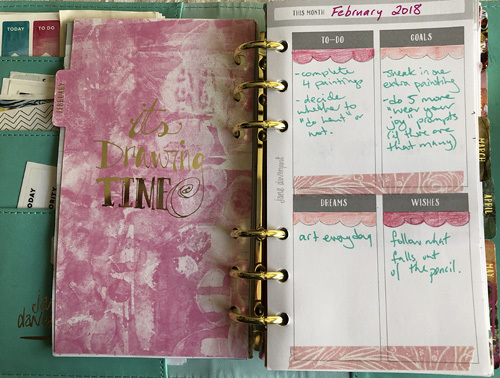 I am also using this planning system to set goals -- not always related to art -- and at the end of the month, I write a page or two of reflections. Want to take a crack at 52 Portraits in 52 Weeks? You can start this week (no need to catch up) by reading my first post on this and joining the Facebook group. There's no cost. Well, outside of sacrificing time and supplies to practice a passion.